It’s really useful to see these side-by-side. I think a lot of people don’t realize how much fashion changed year-by-year back then; I saw an online commenter who thought because he can “still wear things from 10 years ago, and they don’t look out of fashion” that means people years ago felt the same. By contrast, a 1935 Dorothy Sayers novel includes a scene in which people are expected to identify a dress based on its having sleeves from a couple years before. Does anyone have more theories on why this is? One reason is the rise of cheaper mass-produced clothing, but I don’t think that can be the only explanation. I remember one article musing that, because technology now changes so much, other design elements don’t, because it would be too jarring. However, there were so many technological advances in the early 20th century that I’m not sure this theory works. The Sayers reference (I recently re-read Gaudy Night!) reminds me that I occasionally find Butterick patterns for sleeves — for updating your dresses! I’ll try to post some. In the long run, drastic changes in women’s clothing may be only datable by changes in technology — e.g., the fairly stiff lined/bonded knits of the 1960s, the fluid, drape-y knits of the 1970s, Spandex workout clothing, and the stretch knits that now make mass produced clothing possible by eliminating the need for darts or other traditional fitting techniques. We certainly can’t depend on changes in hem lengths, in our “any length goes” decades. I do notice that leggings used to be worn only with tunics over the torso, and now I see them in public without a hip-length-or-longer covering. Oh, I wore leggings in the mid-1980’s with a Hawaiian shirt knotted at the waist over them; that seems shorter than what you’re describing? (My body was different then.) But your point about sewing/fabric technology is a good one. Yes, that was “Gaudy Night” I was alluding to! 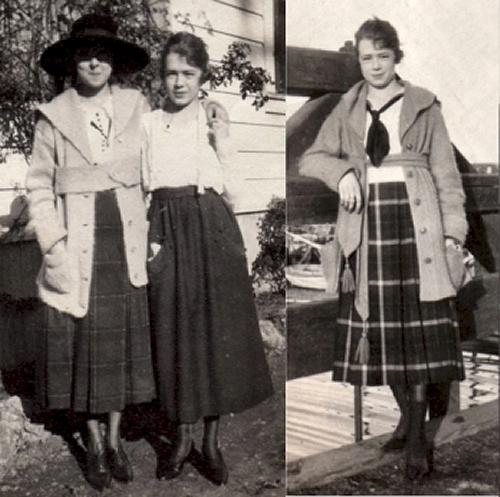 I just came across another reference to rapid fashion changes in Chapter 30 of Sinclair Lewis’ “Ann Vickers” (1933, but the passage is set in 1925): he describes the main character as a random passerby would have seen her: “Her suit was certainly two years old.” Apparently random passersby were able to judge this with ease in 1925. Isn’t it wonderful when a book you’re reading for some other purpose sheds light on fashion? I guess the woman in “Ann Vickers” had not shortened her early 20’s skirt…. Thanks for the memory about the 1980s. I remember being in a grocery checkout line in the late 70s or early 80s; the woman next to me had come from her aerobics class and was wearing a leotard, leggings, and legwarmers. I remember thinking that, if the theory about leisurewear gradually becoming business dress was correct, we’d be seeing such revealing work-out clothes worn in stores and restaurants in the future. It happened.